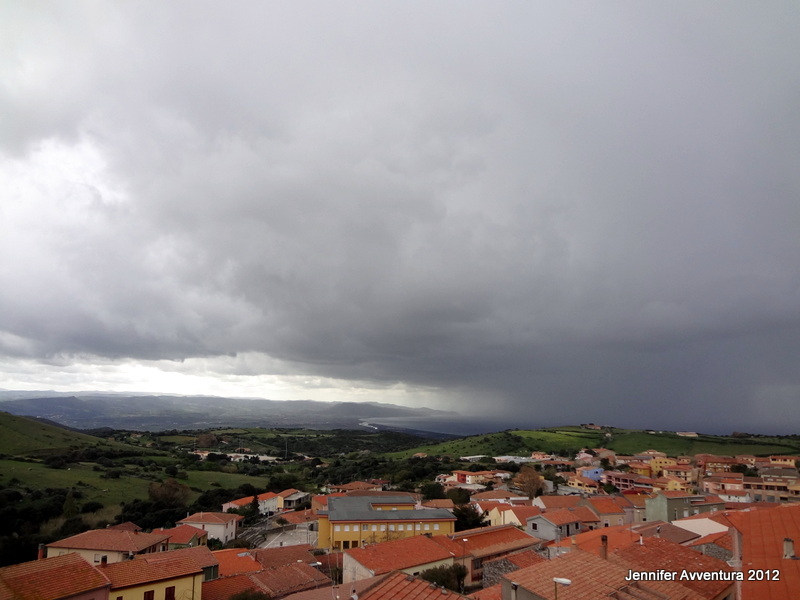 Live update: weather in Northern Sardinia … rotten, cold, windy, crap, rainy, thunder and lightning! Take cover! Looking destructive yet beautiful. Excellent post. Thank you for reminding me what a decent squall of rain looked like. Sounds familiar! It is god awful here lately. Had to get out the wool sweaters! Hope it warms up soon! My parents are actually on their way to Italy for a golf trip. I told them it is cold!!!! We had rain on Corsica too, but enough blue sky to make it OK.
Just the same in England at the moment, rained all week and all night, then was lovely and sunny early on my way to work, and then just rained again all day – and we are being told we have no water down south, drought warnings being given out already. That looked like our sky the other afternoon here. I can’t take it anymore!! It changes so frequently … this morning was bright slue skies and a warm sun, then it rained, then the sun came out again, and now we are experiencing this! Oh, and we’ve just had a ton of hail! Actually in this moment it’s hailing again! Huge ones!